← MICHAEL KELLY SJ. Religious Persecution and Home Churches in China. STEPHEN LEEDER. The Evil You Cannot See. Concern about air quality in Australia popularly centres around two topics: exhaust stacks from city road tunnels and climate change. Neither are as critically important as the effects of small particle pollution. In China, massive problems were noted in Beijing recently due to massive levels of pollution attributable to very small particles. Even though currently we don’t have anything like the challenges facing China it is wise to be well-informed about what is happening in other countries because of our interconnectedness. 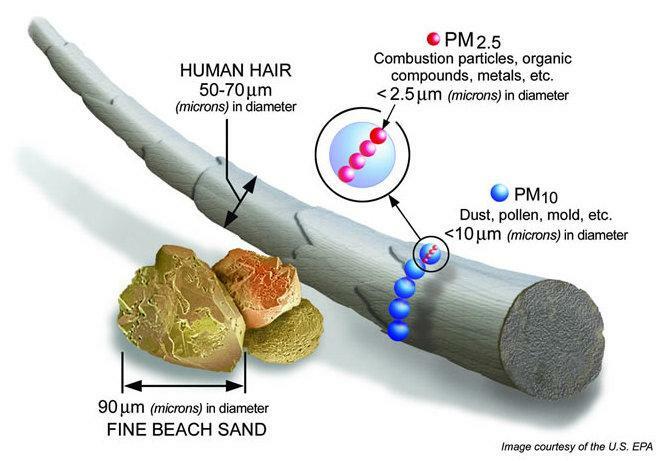 The consequences of small particle pollution can be immediate as well as long-term. They can rank with acute causes of illness like infections and with cigarettes causing heart disease and cancer over decades. Estimates provided by the WHO, the American Heart Association and the Global Burden of Disease team hover around three million deaths a year due to these small particles that are less than 2.5 microns in diameter: for comparison a human hair is 50-70 microns in diameter. These particles are so light that they dance, free of gravity, in our air. Slipping through the nose and throat, they penetrate our lungs where they can pass like oxygen into our blood stream. They are known as atmospheric particulate matter ‘PM2.5’. They do not cause the pollution we can see, although they travel with it. The small diameter of these particles enables them to penetrate to the deepest recesses of the lung unimpeded by the lung’s standard defences. There they can cause local damage or slip into the blood stream. It is this easy access to the whole body via the blood that accounts for their effects on the heart and other organs. 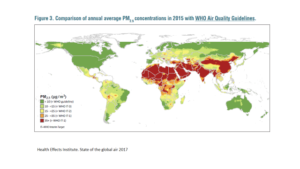 The countries most at risk of problems due to small particle air pollution are clustered around the Middle East and Asia. More generally affluent countries in Europe and in the Americas are not nearly so badly affected. Oh oil – is this another of thy stings? 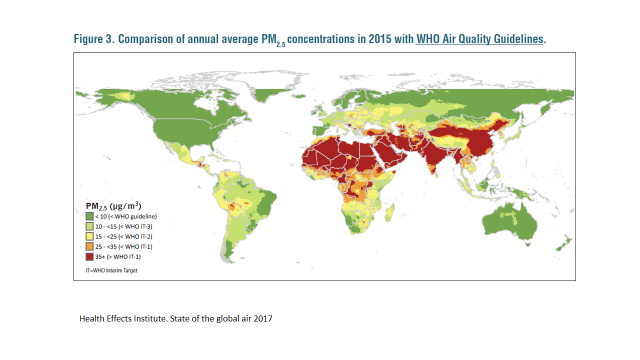 Saudi Arabia and Qatar have the highest annual average concentrations of small particle as so much of their energy requirements are met through the use of fossil fuels – desalination plants, air conditioners and other devices designed to manage the ferociously hostile heat all run on oil. How can such small particles rob us of health? Small particles are a very mixed group – they can be made of a gas. Diesel particles are like tiny meteorites – they have a solid carbon core surrounded by two layers of chemicals. Both the mechanical irritation caused by the particles and the chemical impact of them can cause damage. Small particles can destabilise coronary artery plaques leading to thrombosis. By comparing the death rates of communities exposed to different levels of small particles, and taking into account differences in other risk factors such as cigarette smoking, the GBD group have attributed millions of deaths each year attributable to small particle pollution. Their research is the most sophisticated, but depends on death statistics that are often incomplete or of poor quality, meaning that all estimates are provisional. But research 1996 done by Doug Dockery and his Harvard research group in six major US cities where health and pollution data are less problematic demonstrated the level of justifiable concern about small particles. They found no level of small particle pollution that was entirely without risk. So the WHO ‘safe’ standards are pragmatic, rather as our ‘safe drinking’ levels of alcohol consumption do not mean that even small amounts of alcohol are free of health effects. 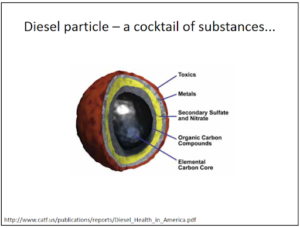 The American Heart Association, the AHA, has taken a deep interest in small particle pollution, partly because the majority of deaths attributed to it are deaths from heart disease. After looking at all the studies the AHA concludes that larger particles are not associated with an increased risk of death, just the evil tiny ones that you cannot see. What can be done? The measures that have successfully rid our skies from large particle pollution – clouds of black smoke and high levels of sulphurous pollution – will help reduce the levels of small particle pollution. Moving from diesel to natural gas for large motor vehicles in the long term would be a welcome move. Renewable energy may reduce the production of small particles – you would need to ask someone else. In the meantime, by following air pollution indexes, patients with existing lung or heart disease should be warned not to exercise vigorously or unnecessarily on days when the small particle levels are high. The atmosphere is not indifferent to our fuel-burning activities Small particle pollution is yet another example of how important it is to assess our activities to see what cost we are imposing on our environment. This entry was posted in Environment and climate, International Affairs. Bookmark the permalink.